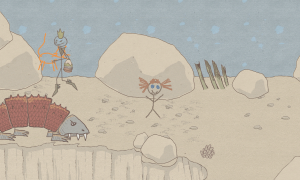 One of the games that are part of the latest Humble Bundle is Draw a Stickman: EPIC. It is an adventure game with a little bit of RPG where we must draw elements to advance through the story. When we start the game, we have to draw our own character, with total freedom to our imagination. 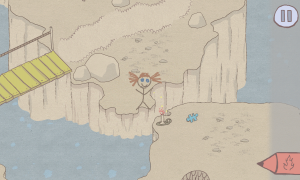 Soon after, we will notice that it is extremely boring to be alone, and our stickman wants a friend. We then draw the friend that we like for our newly created character and choose a name for him or her. However, our happiness ends soon, as the new friend is very curious and decide to go exploring a suspicious book that immediately swallow him. From here on, our mission consists on jumping into the book to rescue our new friend. The game is divided into levels, spread across the pages of a book. From there, we can see our progress and situation, and know at all times how many level we need to fulfill to save our friend. Each level has multiple solutions, as we can unlock different ways, so the paths forward is not predefined. Depending on the options we choose in each level, we can follow a route or another, and there is always have the option to replay levels overcome to find alternative routes. Within each level we can find pieces of a puzzle. 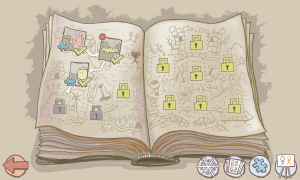 These pieces are hidden somewhere in the scenario in a place that is not necessary to go to pass the level, but we can look for them if we like to explore the whole map. They are usually hidden behind a more complicated puzzle than the rest, and it will require a little more ingenuity to get the pieces. To advance within each level, we can move our stickman with touches or holding down on the direction we want to advance. However, we need to dodge obstacles as he always moves in straight line to the direction we are pointing. To remove obstacles and solve puzzles, we have four magic pens that we can use to draw objects to interact with the environment. There are four types of pencils: to draw fire, clouds (rain or storm), keys, and axes. With these pencils, we must find solutions to get out of the different situations that we encounter. There is an extra level that we can unlock where we must rescue a bunch of penguins kept prisoners by elves. For this level, we have an extra pencil to draw snow clouds to freeze the aggressive elves, which are continually bombarding our stickman with snowballs. Draw a Stickman: EPIC is available for iOS and Android. There is a free version that gives access to the first levels of the game and if we like it and want to unlock the rest, we can buy it for $1.99 on the Google Play and the App Store respectively.